Puerto Rico's mountainous central region was hard hit by Hurricane Maria. PUERTO RICO IS estimating in a report to Congress that Hurricane Maria killed more than 1,400 people, though an island official said the confirmed toll remains frozen at 64 pending a scientific review due out soon. The government, relying on updated statistics it first reported in June, said in a report to Congress detailing a $139 billion (about €120 billion) reconstruction plan that there were 1,427 more deaths from September to December 2017 than the average for the same time period over the previous four years. The administration of Governor Ricardo Rossello stopped updating its official death toll months ago and ordered an investigation amid reports that the number was substantially undercounted. Public Safety Department Secretary Hector Pesquera said the new total will reflect the findings of the investigation, which is expected in the coming weeks. Hurricane Maria, which came just two weeks after Hurricane Irma passed near enough to cause damage to the island, knocked out power and water across Puerto Rico and caused widespread flooding that left many sick and elderly people unable to get medical treatment. Some people are still without electricity 11 months later. The government commissioned an independent epidemiological study by George Washington University and the Milken Institute of Public Health that is due in the coming weeks. The use of the higher death toll in the report to Congress was first reported today by The New York Times. 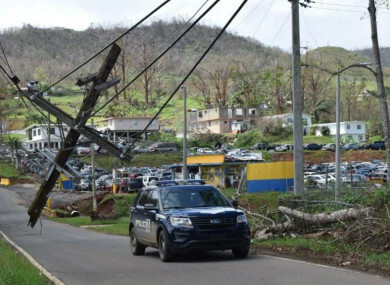 Most of the deaths occurred not in the initial storm on 20 September, but in the ensuing days and weeks when the island-wide electricity outage and roads blocked by downed power lines and other debris made it difficult to move around and emergency services were stretched beyond their capabilities. Government agencies have used various methods to count storm deaths over the years, with authorities generally trying to sort them into direct and indirect deaths to include people whose deaths are tied to a natural disaster without necessarily being obviously caused by it. Email “Puerto Rico says Hurricane Maria killed 1,400 people, but death toll remains at 64 ”. Feedback on “Puerto Rico says Hurricane Maria killed 1,400 people, but death toll remains at 64 ”.